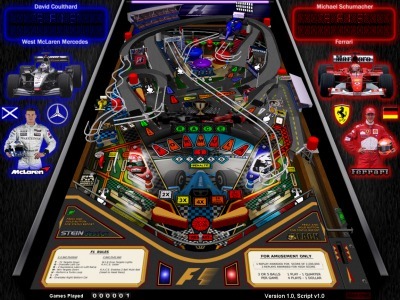 Caiman free games: F1 Pinball by Stein design and Black. Well after nearly a year of development (months of talking about it, preliminary design and a lot of very hard work) , Stein and myself can present the first release our joint game 'F1' for Visual Pinball. The Game is designed around Forumla 1's Michael Schumacher and David Coulthard's battle for the championship. The table is a true 2 player table where the players battle each other for the championship, accompanied with lots of Murray Walker remarks about each driver and challenging game play. The game can be adjusted via operator menus to suit the level of skill the player requires.